Amazon.com description: Product Description: Silicon Valley legend Ray Zinn shows entrepreneurs and executives how to lead by tackling the Tough Things First. About: Silicon Valley pioneer Ray Zinn, CEO of top microchip company Micrel for 37 years, shows entrepreneurs and executives how to lead and succeed by tackling the Tough Things First In high school, Ray Zinn’s track coach told him he was too short to run the hurdles. 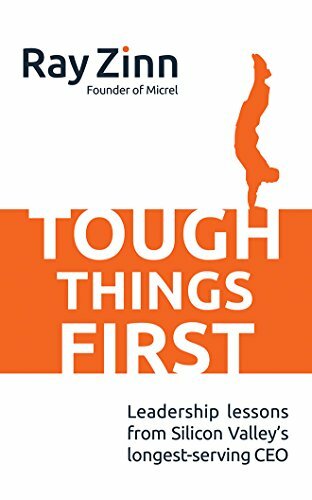 Mp3 una edition from McGraw-Hill Education (August 9, 2016); titled "Tough Things First: Leadership Lessons from Silicon Valley's Longest Serving Ceo"
About: Silicon Valley legend Ray Zinn shows entrepreneurs and executives how to lead by tackling the Tough Things First. Unabridged edition from McGraw-Hill Education (August 9, 2016); titled "Tough Things First: Leadership Lessons from Silicon Valley's Longest Serving Ceo"